Asia Square, Tower One building. BlackRock Inc. (NYSE:BLK), on Monday, agreed to sell its 43-storey Singapore office tower 1 to the Qatar Investment Authority (QIA), Qatar’s sovereign wealth fund, making an Asia-Pacific record with the $2.5bn deal ($1,980 per square foot), signaling a change in the city’s dwindling real estate market. Announcing in a joint statement BlackRock agreed to sell Asia Square Tower One which has more than 1.25 million sq ft net leasable area, housing Citi Inc. as the main tenant, Google Inc., and KKR & Co. among others., Google Inc. is planning to relocate, on expiration of the lease this year to a park outside its primary business district with expansion in Singapore, according a report. QIA, the buyer of the property, has been considering diversifying its investments in Asia in addition to Europe. Asia towers were built on two adjacent plots, won at government land auctions by MGPA, which was acquired by BlackRock in 2013. 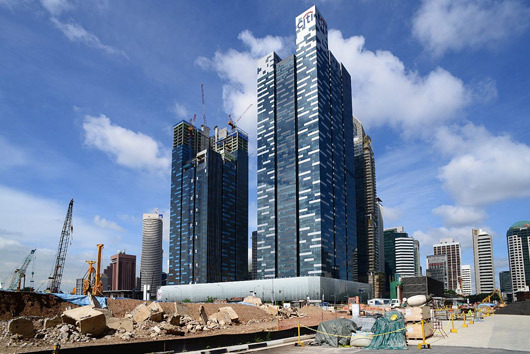 The second tower in Asia Square, is also owned by BlackRock with a leased portion of 90 percent which might also be considered for next to be sold-off after according a statement from BlackRock. Although BlackRock expressed contentment in the $2.5bn (S$3.4bn) deal, it declined to discuss further financial details, there have been media reports of BlackRock expecting above S$4bn from the deal. The building came up for sale last year but bids by a conglomerate of Norway’s wealth fund and CapitaLand Ltd., Singapore’s largest developer, and rival bids by ARA Asset Management Ltd. failed to be finalised. “This is not a deal that triggers more deals, because of the supply and demand situation,” expressed Nicholas Mak, executive director at SLP International Property. Real estate developers are expected to augment 4 million square feet of office space in Singapore this year – amounting to almost 5 percent of the current market and another 1.4 million in the coming year. Similar valuations, on a per square foot basis, were gained in a 2014 Singapore deal, according to consultancy firm Cushman & Wakefield. “There has been a lot of near-term negativity on the Singapore market,” John Saunders, head of Asia-Pacific for BlackRock Real Estate, said, “I think it’s a little bit overdone. There is some new stock coming on, but what tends to happen in Singapore is you get a big piece of supply that temporarily can disrupt the market, but then demand is always usually pretty strong.” Both the Asia Square towers are 90 percent leased with less than 4 percent vacant, Saunders said. For Qatar, the second-biggest foreign purchaser of U.S. offices in 2015, Asia Square adds to the list of its real estate assets besides four Los Angeles office properties purchased this year with real estate investment trust Douglas Emmett Inc. for $1.34 billion, London’s Canary Wharf Group and parent Songbird Estates Plc. According to Real Capital Analytics Inc., the wealth fund’s global investment in real estate has been about $38 bn. This includes $21.7 bn in office properties, $7.5 bn in hotels, and the purchase of the St. Regis Rome in 2014. Receive Blackrock News & Ratings Via Email - Enter your email address below to receive a concise daily summary of the latest news and analysts' ratings for Blackrock with MarketBeat.com's FREE daily email newsletter.